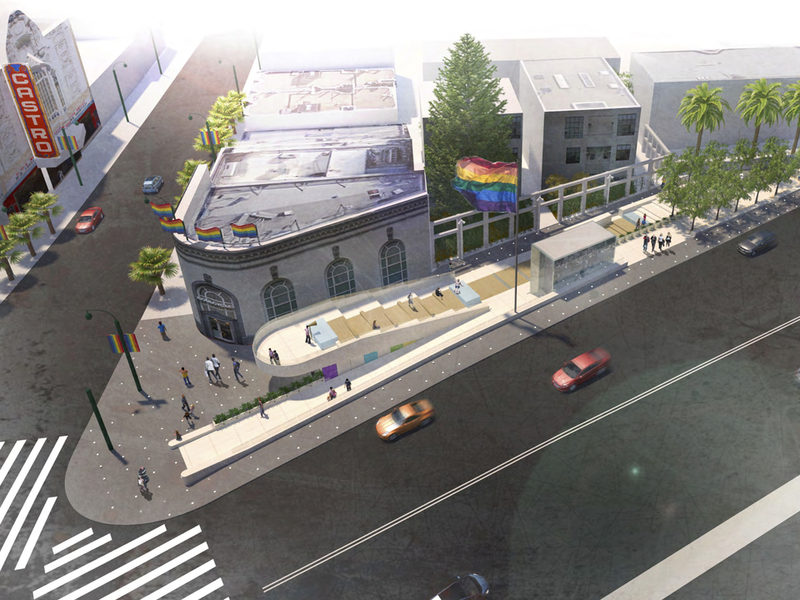 On Tuesday, neighborhood association Friends of Harvey Milk Plaza (FHMP) revealed semifinal architectural designs for the redesign of Harvey Milk Plaza and Castro Station. Because the station doesn't comply with the Americans with Disabilities Act, SFMTA must renovate the facility. The city agreed to take the plaza's historical significance into consideration during the project's planning, and chose to execute the construction and redesign simultaneously to reduce expenses. The group was formed in 2016 by members of the Castro Communty Benefit District, Castro Merchants, and other stakeholders from the area. According to its web site, the group is "committed to maintaining and improving the public space named in honor of the civil rights icon." The project has been a source of some controversy: after New York-based architectural firm Perkins Eastman was selected in an international competition to redesign the space, many in the community opposed the winning design. The designs announced this week were chosen after FHMP hosted four community meetings seeking additional feedback and input. 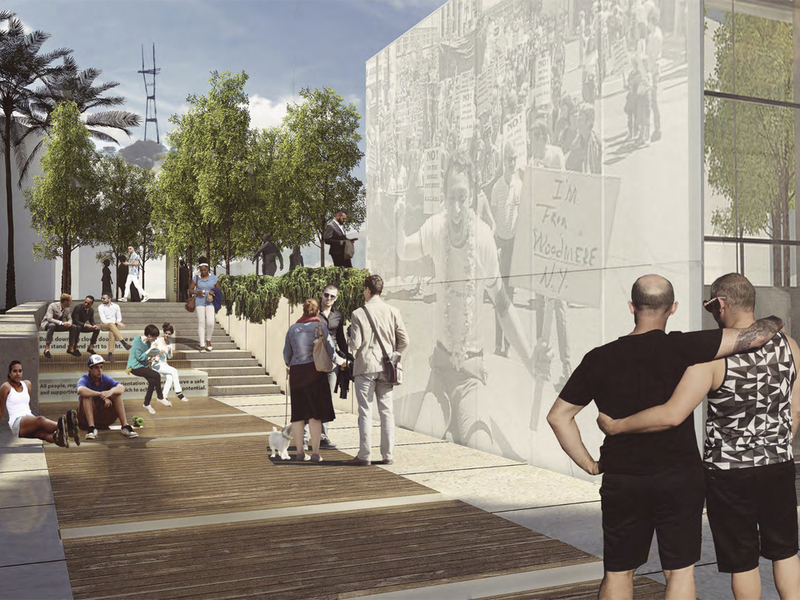 Semi final design overlooking Harvey Milk Plaza. 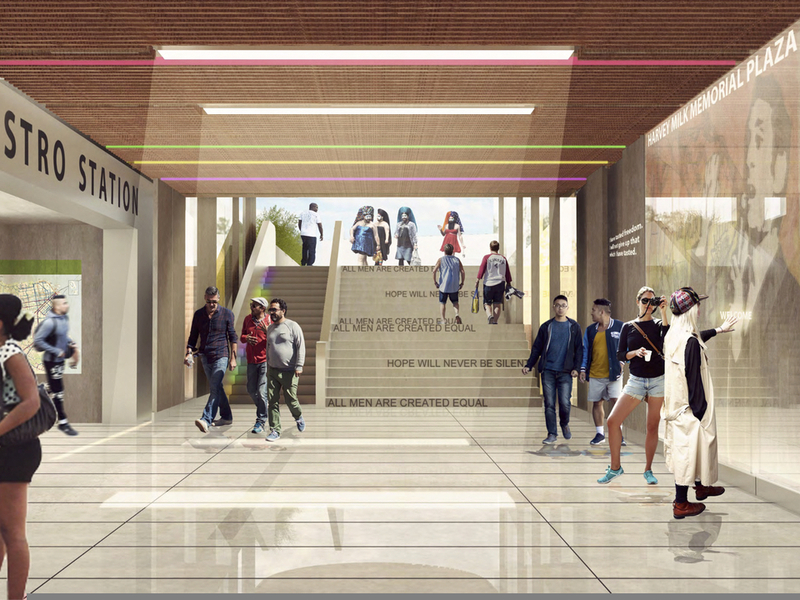 According to the press release, "the presented designs address a wide variety of community desires and concerns including inspirational elements that appropriately memorialize Harvey Milk as well as greenery/landscaping, a place for gathering, open sight lines, better circulation, improved access and short term seating." The selected designs include three tributes to Milk, increased open space, a widened sidewalk along Market Street, increased lighting, street-level vegetation, a roll-down gate at the MUNI station, and elevator access from Market Street. MUNI station stairway has been realigned. 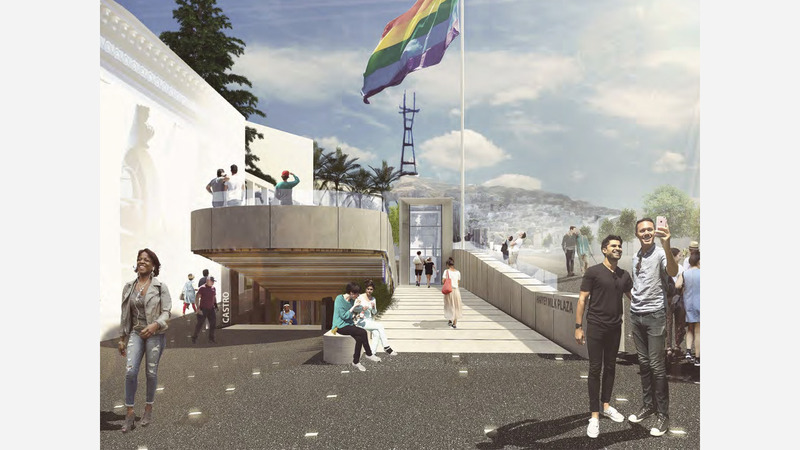 All semifinal designs retain an elevated terrace overlooking the Castro that's meant to serve as a gathering place, but in previous sessions, many community members voiced concerns it would attract unwanted behavior and crime. "The issue of unwanted behavior is a citywide issue, and we acknowledge that it will not be solved in the span of a single project," FHMP member Erin Elliott told Hoodline. "However, we were able to incorporate smart design features into the new proposal." Elliott said features include improved sight lines and transparent elements that allow for monitoring; the ability to secure the plaza's lower area at night; eliminating its current sunken landscape; placing low walls that encourage sitting but not lying down, and creating circulation patterns that activate the space. "We believe that we shouldn't stop building public spaces, especially one as important as Harvey Milk Plaza, while the issues of drug use and encampments are being resolved by city leadership," Elliott said. Harvey Milk Plaza by night. Former District 8 Supervisor and current State Senator Scott Wiener said, "community engagement is what helped get Harvey elected to office, and it's fitting for the community be so engaged in this tribute to his legacy." "I want to thank the Friends of the Harvey Milk Plaza and the Castro CBD for their continued efforts to create a plaza that works with our public transit systems, serves as a community gathering space, and celebrates the legacy of Harvey's work," he added. With semifinal designs selected, the project may now proceed to the approval and permitting process. 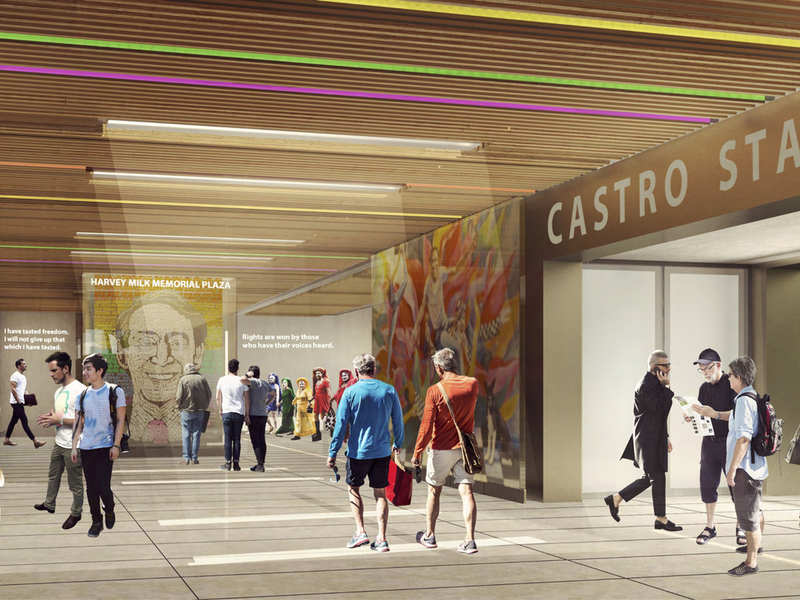 Proposed Harvey Milk memorial at Castro MUNI station. Within the next two months, Elliott said FHMP will release new renderings. After that, the designs will be evaluated by SFMTA, BART, the SF Arts Commission, and several other city agencies. "This will be an iterative process and the project will continue to evolve in response," she said. 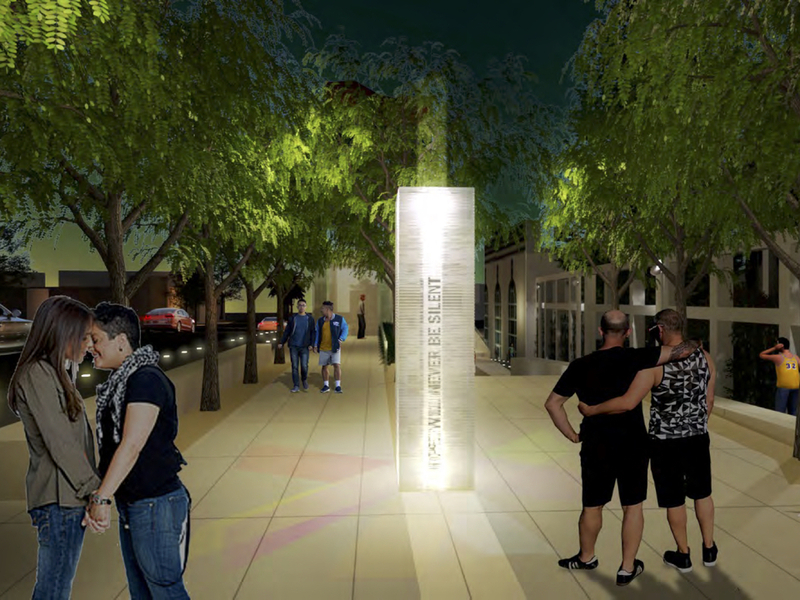 Friends of Harvey Milk Plaza will begin fundraising to cover the costs of installing aspects of the new project that honor Milk's memory. To receive updates, sign up at friendsofharveymilkplaza.org.